The recent deaths of former Red Sox players Frank Sullivan and Frank Malzone, got me thinking of my days growing up in Springfield, Massachusetts back in the 1950s and 60s. Back then, my father would take my brother and me to two baseball games every summer. One trip would be to Fenway Park in Boston to watch Malzone, Sullivan and, of course, Ted Williams. The other trip was to the North End of Springfield, to Pynchon Park, to watch an evolving cast of would-be prospects of the team formerly known as the New York Giants. 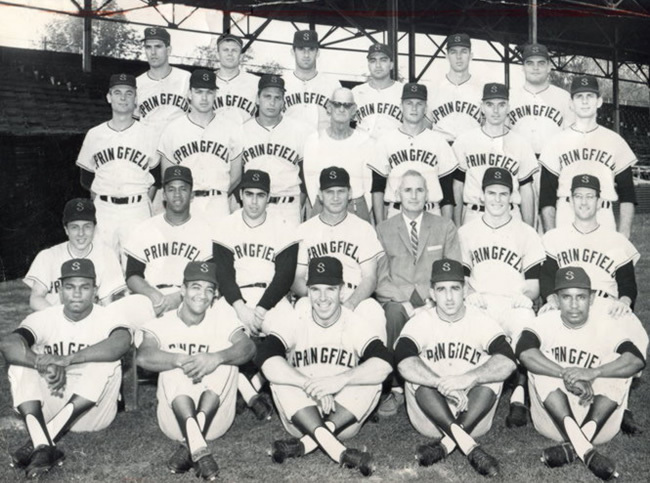 The A/AA Springfield Giants of the Eastern League were in existence from 1957 through 1965, and actually followed the Springfield Cubs into Pynchon Park at just about the time the parent organization was planning its move to the west coast. The park, (named after William Pynchon, one of the founders of the city) sat on the banks of the Connecticut River, right next to the North End Bridge, and was the home to a great many future San Francisco Giants, including several who played in the 1962 World Series against the New York Yankees. Perhaps the greatest of them all was Juan Marichal, who won 243 games in 10 years with the Giants and was 18-13 in 1959 with and astounding 23 complete games and 8 shutouts. One of my strongest memories of those days was sitting behind home plate in a game he was working and seeing that insanely high, trademark leg kick of his. It was not something you forgot. Other members of that ’59 club,that I had the opportunity to see in their formative years, included infielders Jim Ray Hart, Manny Mota, Hal Lanier, as well as outfielders Matty and Felipe Alou, plus right handed pitcher Julio Navarro. I should also include Moose Stubing on this list, as he went on to play in the minor leagues for 12 seasons before getting into 5 games with the California Angels, shortly before retiring from baseball and becoming a character in a Kevin Costner movie. (I think I made that movie part up.) But before I forget, Felipe Alou maybe better known to you as the father of Moises Alou, who went on to a baseball career of his own, as well as starring in a “30 for 30” with Steve Bartman. Given the location of the league (aka the New York- Penn League) you won’t be surprised by the fact that most of the northeast MLB teams had affiliates in it, including the Red Sox, Yankees and Phillies. As a matter of fact, another of my more vivid memories from those days is seeing a young Phillies prospect by the name of Richie Allen put a shot into the left centerfield light tower. No small feat at any ball park. In addition to Allen, a few other names that may ring some bells for you baseball fans included future Phillies Art Mahaffey, Curt Simmons, and Bobby Wine, who played at Williamsport. Future Red Sox Bob Tillman, Tracy Stallard, and Galen Cisco, who were members of the Allentown Red Sox. Yankees fans may remember outfielder Tom Tresh for his 9 years in New York, after spending a season with the Binghamton Triplets. New York fans may also remember Stallard as the pitcher who gave up homerun number 61 to Roger Maris in 1961, as well as Cisco for being an original member of the Mets. Amazing!